Our camp was very near this little town. Beaches are like people, they have different personalities. Portugal has 1,115 miles of coastline, but no two beaches are alike. Some are popular, always crowded with sun worshipers. Others are shy and choose their friends carefully. 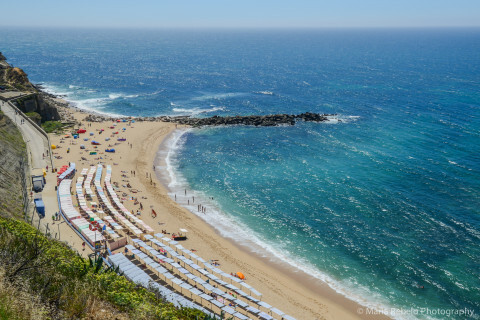 One of these shy beaches is Ericeira, 40 miles north of Lisbon. Everybody loves Ericeira when the sun is shining and the sea is balmy. But Ericeira tests its visitors to make sure they deserve its beauty. So, there are cooler days to discourage those who complain that Winter spends the Summer at Ericeira. And foggy days to see who appreciates the joy of walking on a misty beach. Sometimes the sea is rough to see who is in awe of the ocean roar. Other times, the wind blows to see who feels invigorated by the ocean smell. We stayed there one year before the camp was built. We stayed in a little pensao. Personally, the idea of cooler, days, mist, wind and roaring oceans appeals much more to me than sun and heat… must be my northern blood. That looks awesome! I would swim, I think. Do you think they want a tough guy like you? Ooo, maybe they would be scared. Yes, they might take one of those. I am convinced there are no two beaches are alike anywhere, although I’m sure Portugal’s must be magnificent. Don’t I wish. The best ones, they say, are in the Algarve.